The oxygen anion in the phosphate group is likely to be bonded with a hydrogen cation and thus forming a hydroxyl. When the phosphate group is condensed with glycerol to make a phospholipid, is the hydroxyl from the glycerol molecule taken or the hydroxyl from the phosphate group taken? I believe it's related to the difference of electronegativity of oxygen and phosphorus which causes unequal sharing of electrons between atoms, thus making a hydroxyl from one side easier to get taken off than the hydroxyl from the other side is. In all phosphorylation reactions, the oxygen of the hydroxyl group in the substrate attacks P of phosphate. This is because of high partial positive charge on P which is bonded to four highly electronegative oxygen atoms. 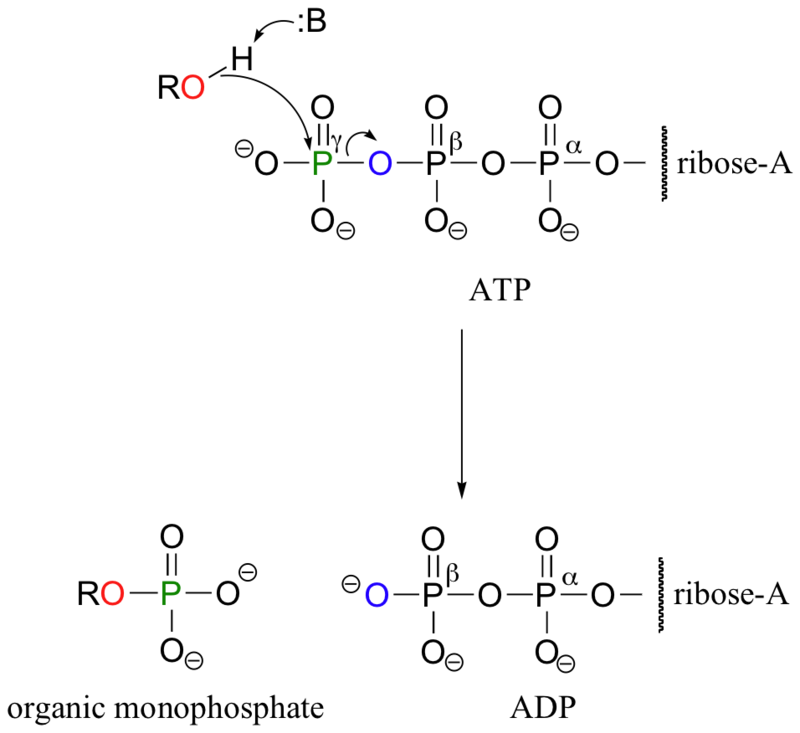 When the bond forms between the substrate oxygen atom and phosphorus of terminal phosphate, electrons are transferred to the O that bridges the ester bond between 2nd and 3rd phosphate. Therefore the O of the substrate is retained and that of the terminal phosphate (of ATP) becomes the part of the 2nd phosphate (now terminal phosphate of ADP). My recollection is that the formation of a phospholipid normally involves acylation of glycerol 3-phosphate. Glycerol 3-phosphate is a glycolytic intermediate, and so there is no actual phosphorylation of a glycerol; the phosphate on the glycerol will have come from the phosphorylation of glucose or of fructose 6-phosphate. In a kinase reaction the oxygen of the -OH in the acceptor acts as a nucleophile at the P of the phosphate, so in terms of your question the O atom comes from the acceptor, not the donor. Presumably if there was a glycerol kinase (I expect there is) it would have the same mechanism so the O would come from the glycerol.